Red Wine, Green Tea and Dark Chocolate: Celebrate the Glorious Pumpkin! Pumpkins. They make delicious pies. This time of year we love to use them to decorate porches and as spooky lanterns for Halloween they can't be beat! But remember their starring role is in the kitchen. A rich array of nutrients, in the pumpkins' pulp and seeds, deliver a number of health benefits, including protection against colds and flu. The bright orange color is proof that pumpkins are loaded with beta carotene, an antioxidant that protects against some cancers, heart disease, premature aging, and infections. Pumpkins also serve up vitamins E and C. Together with the beta carotene, these nutrients also help to keep our skin and eyes in good shape. We all should try eating more orange-colored foods — such as pumpkins and sweet potatoes — during winter months to power up our immune systems and beat the odds against colds, flu and pneumonia. Pumpkins like most other vegetables are full of potassium (which helps to keep blood pressure in check), other minerals, and fiber. 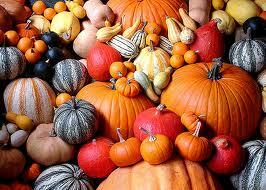 Pumpkin seeds contain an oil that may be beneficial for the prostate, plus cholesterol-lowering phytosterols. The seeds, which make a healthy snack or add crunchiness to salads, soups and other dishes, also have anti-inflammatory properties.